Capitol Crating is the Sacramento area's Premier Packaging, Crating & Shipping Service. No one offers more packaging or shipping options. Serving Northern California since 1986, our knowledgeable and friendly staff always does their best to provide you with the exceptional service you deserve. 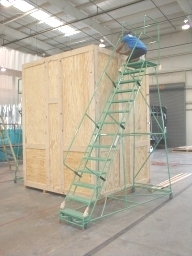 We specialize in the computer design/engineering and manufacture of crates & containers. Our experienced crews are available 7 days a week to pack on-site at your facility or we can arrange pick up for packaging/crating service at our location. Our shipping department handles shipment of all kinds and types of freight to all ports in the U.S. and most ports worldwide by truck, ship or air. At Capitol Crating, there is always a solution to your packaging and shipping needs. From heavy duty crating for everything from plant machinery to a collector's motorcycle, to the most delicate art, antiques and glass, we know what it takes to get the job done right. Engineered to withstand the abuses of modern transportation.